The absolute simplicity of this four-ingredient countryside pear jam recipe is only a side benefit. The star of this jam is the sparkling clear flavor of fresh pears, accented with just the tiniest dusting of cinnamon and cloves. These pear preserves are a classical, French confiture; they require no pectin, only sugar, to thicken into a hearty confection. This recipe calls for the jam jars to be processed, which allows you to store the jam jars for months in a cool, dark pantry. If you are not interested in processing your homemade jam, you can still follow the recipe and make the jam. At step 3, simply store the jam in any sealed container. If you do not process it, you must store it in the refrigerator and it will only keep for about two weeks. Add all the ingredients to a large saucepan and bring them to a simmer over medium heat. Lower the heat slightly, and simmer the jam, uncovered, stirring occasionally, for 90 minutes to 2 hours. Make sure to stir the jam well and avoid scorching the sugar and fruit. The jam is finished when it is completely smooth, without any lumpy pieces of pears. Remove the pear jam from the heat; skim off and discard the foam with a clean spoon. Ladle the finished jam into hot, sterilized half-pint jars, leaving 1/4 inch headroom. Wipe the rims with a clean towel, seal, and process in a boiling water canner for 10 to 11 minutes. Allow the jar to cool on a clean towel and check the seals before storing the jam in a cool, dark place. 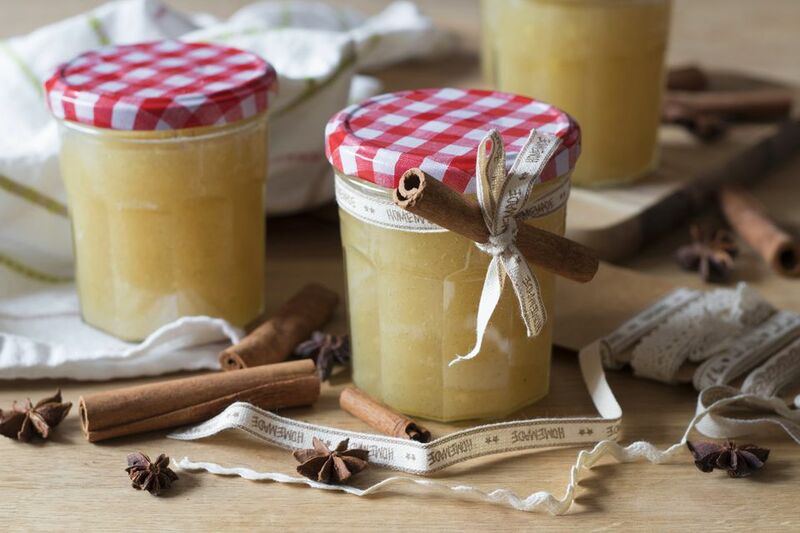 The sealed jars of the pear jam make wonderful gifts for friends, neighbors, or hosts. Simply label the jars, wrap a bright ribbon around the jar, and you have a perfect gift. This homemade countryside pear jam is a real treat in the morning. It's perfect spread on hot buttered toast, an English muffin, or even a classic peanut butter and jam sandwich. The pear jam is also an elegant pairing with a cheese or charcuterie board. The sweet taste of the pears goes well with most cheeses. It can stand up well to a funky blue cheese or accompany a smoother sweet goat cheese. The pear jam can be used on baked proteins as well. Use the jam as you would an apricot jam on baked chicken for a sweet and savory dinner. Once you've successfully made this jam once, try some alternative spices, including cardamom or ginger, for a more exotic taste profile.